This year, we will highlight the future of the Spiritist Movement in its three aspects: philosophical, scientific and moral. Over the course of the conferences, future perspectives for each of those aspects will be developed. Our speakers will be able to give their testimony on the way in which the Spiritist Codification is perceived, as well as on the impact that they have observed in their region or in their field of work. 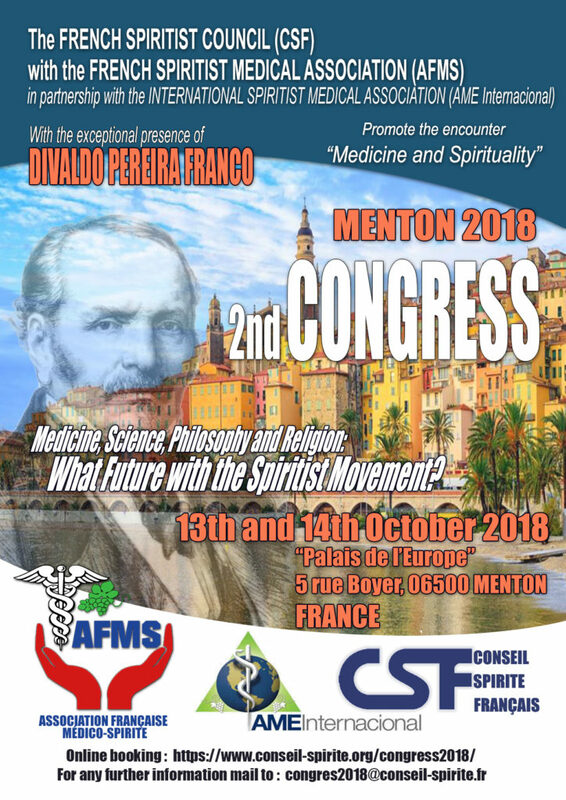 As long as the scientific scope is concerned, it is the medical aspect that will be emphasized with the participation of doctors and researchers, who will propose several conferences under the auspices of the International Spiritist Medical Association “Association Internationale Médico-Spirite” (AME International), and the French Spiritist Medical Association “Association Française Médico-Spirite” (AFMS), with subjects approaching new concepts from the angle of the knowledge proposed by the Spiritist Codification and its continuators, as well as through studies and recent experiments highlighting the relevance of the Medical Spiritist Paradigm. With regards to the philosophical part, several speakers will tell us about how Spiritist Knowledge can impact our society through the existential questions to which it responds. What is the vision from which humanity could benefit thanks to the proposed answers? Several orators, including our friend Divaldo Peireira Franco, will also be present to give us a glimpse into this possible vision of the future. Finally, concerning the moral sphere, we will have the immense pleasure of receiving Monsignor Gérard Berrier, Bishop of the Apostolic Order of the Hospitallers of Saint John, member of the Old Roman Catholic Church, who will speak about Christian fraternal friendship, which unites us through our common convictions – regardless of church affiliations – and based on universal moral precepts. This conference foreshadows how the Spiritist Movement can be perceived by religious currents, and how it is possible to remain close to each other, thanks to our shared values and mutual respect. Same as last year, this Congress is organized jointly with the French Spiritist Medical Association. We will therefore have the pleasure to meet there many other guests, whose participation will be confirmed in the weeks to come. We will not fail to come back to you for more specific information. Several conferences will be presented in Portuguese, and the translation in French will be available. Please note that the guest list is, as always, subject to changes before the publication of the final Conference Program. There is no more tickets for sale as we are sold out. Please note there will be no direct sales on site as we reached the maximum authorized amount of people. You will be able to watch most of the lectures on our YouTube channel from Saturday the 14th in the morning. Our Congress this year will take place in Menton, city located in the department of Alpes-Maritimes (06), France. Although initially planned in Nice, we opted for Menton mainly thanks to its optimum conditions of reception for the Congress delegates, the beauty of the city and its calm atmosphere. The Congress is planned to take place at the “Palais de l’Europe”, a highly-prized venue for congresses and exhibitions. It is also possible to reach the train station (SNCF) of “Nice Ville” from the airport, by taking the express line number 99 (please see links below). You may catch the train to Menton train station (SNCF). The “Palais de l’Europe” is a five-minute walk from Menton train station. The services are regular, with departures every 30 minutes approximately. If you come from the airport, you can take the 110-Express line. A shuttle bus is departing from the airport every 30 minutes towards Menton bus station. The Palais de l’Europe is a 5-minute walk from the bus terminal. If you come from the coast, you can take line 100, bus stop: CASINO, which is a 3-minute walk from the “Palace of Europe”.